In January Christian from Stellar published “2018 Stellar Roadmap“ (check out here what Stellar is). Jokingly (at least I hope so) Christian shared a 12kk increase in “the critical indicator for a decentralized protocol” (original emphasis), namely randos per week (r.p.w or rpw; number of random people talking about crypto) and promised equally moonish growth. More attention around crypto is important because crypto diffusion — a two-step process (see Two mental steps towards cryptoasset diffusion) takes time. The more people know about it, the faster it will diffuse. Besides that, they shared their goals for 2018, namely SDEX (Stellar Decentralized Exchange), improving ecosystem support, integrating the Lightning Network and some secondary tech objectives. Stellar’s goal #1 for 2018 is to build their decentralized exchange named SDEX. The initial milestone was set at the end of 2017 where they recruited a “veteran team” for SDEX. Also, they referred to their partnership grant for fueling projects such as SDEX. Except for that, however, no further news regarding the exchange just promises about future updates. As a secondary goal they listed their intention to improve the ecosystem through very general marketing-tasks (“better overall brand communication”, “more implementation walk-throughs to help people get going”, “better technical documentation, including release notes”, “continued improvement to our Horizon API and the surrounding SDKs”). Particularly because such vague statements are impossible to measure, one must take these statements for what they are — statements. 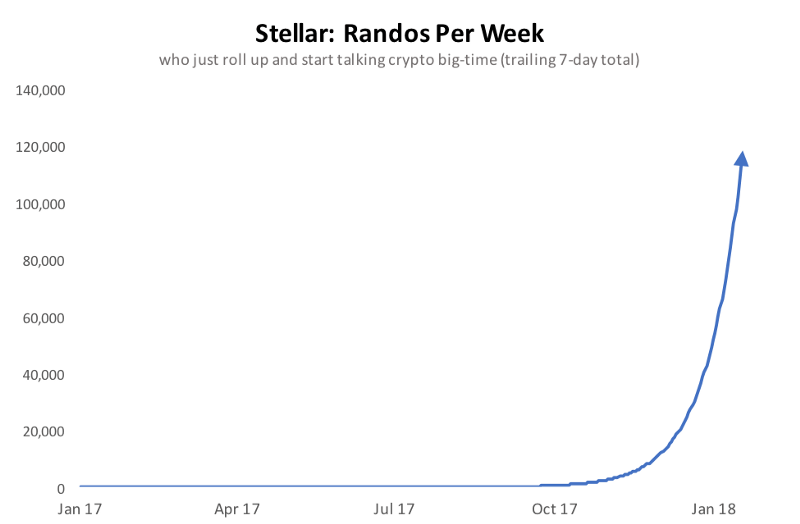 However, as I have mentioned in Thoughts on “Stellar and the State of Cryptocurrency”, I consider the mere presence of marketing talk positive because marketing is important and – as indicated above – crypto diffusion takes time. Stellar’s goal #2 for 2018 is to integrate Lightning in 201. More details were promised to come. Besides that, analogously to above, nothing special here. Here is the list of people they hired in September and October (copied blatantly from the respective sources). I have no opinion on whether they are “veteran”. Tom Llewellyn-Smith is a Unix systems engineer specialising in large-scale distributed systems, configuration management and systems security. Prior to Stellar Tom designed and managed infrastructure for gaming, science and finance companies.